Since 1998, Colorado Preservation, Inc. has been working with communities throughout the state to save endangered historic buildings, landscapes, and archaeological sites through its Endangered Places Program. 2019 year marks the 22nd anniversary of Colorado Preservation, Inc.’s Saving Places® Conference and Most Endangered Places list. 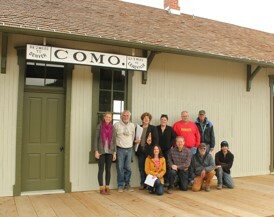 This program provides advocacy, awareness, and technical assistance to significant historic sites throughout Colorado that are in danger of being lost. Colorado Preservation, Inc. devotes staff time and resources to raise funds and rally concerned citizens so that listed as well as un-listed sites can be saved. In 22 years, the Colorado’s Most Endangered Places program has highlighted 125 historic sites throughout the state; 47 sites have been SAVED and only seven have been lost. The program has a wide reach, with sites located in every region of the state in 49 of the 64 counties. Colorado’s Most Endangered Places are located throughout the state. The general public is invited to visit, learn and be inspired! Experience Colorado’s history firsthand by picking a region and taking a self-guided road trip. Discover past stories behind the listed endangered sites! Working on a historic property? Make sure to consider the Secretary of the Interior’s Standards for Rehabilitation. These categories are often site specific as to what they actually constitute; however, generally a “Save” constitutes that the historic resource is no longer endangered and threatened. This often means that one or more of the following have been completed: rehabilitation, restoration, preservation, conservation, documentation, stabilization, interpretation. When sites are ”In Progress” this means that they are currently in the process of the aforementioned; however, the work is not complete. “Alert” means that the Listed sites are still in the planning process to become a “Save,” and “Lost” means that the site has been demolished. Since the inception of the Endangered Places Program in 1997, Colorado Preservation, Inc. has only lost 6 sites. While this is a good track record, with these losses there are important lessons to be learned. One of the biggest lessons we have learned is that community support is huge. How a site moves from “Alert” to a “Save” depends in great part on how involved and dedicated the community is to protect the resource. In recent years with the loss of the Given Institute in Aspen, and the Baldwin building in Holeyoke, we have learned that it is best to be pro-active regarding advocacy and outreach on the benefits of preservation and historic resources in general. Over the years we have also learned the importance of engaging, educating, and empowering communities not only with the outcome of a particular listed endangered resource but also on how to prevent future threats. At the heart of historic preservation are the dedicated efforts of individuals. Successful preservation requires the collaborative efforts of many and Colorado Preservation, Inc. needs your help. 2. Volunteer your time to a local preservation organization or Colorado Preservation, Inc Many of our Endangered Places sites hold community work days to cleanup and/or restore the building. Signup to receive the Colorado Preservation, Inc. newsletter to keep up-to-date on the latest calls for volunteers. If you are interested in learning more about how to save a particular Endangered Place site, contact Colorado Preservation, Inc or visit the individual site page to learn more. 3. Join Colorado Preservation, Inc. Your membership to Colorado Preservation, Inc. helps us build a future with historic places in Colorado. Membership allows us to provide technical assistance to communities, nonprofit organizations, and individuals for grant preservation project management, interpretation and advocacy. Become a member today! 4. Donate to a particular Endangered Places site or the Endangered Places Program Many of our sites have associated nonprofit groups who hold fundraisers or would appreciate donations, which go towards stabilization and restoration. View the individual site page to learn more. 5. Share the information about the Most Endangered Places Program with friends, local preservation groups, or local officials.